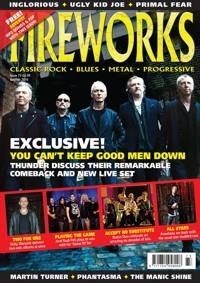 Please note: We sold the last copy of Fireworks #73, physical copies are no longer available from Rocktopia. You can still buy the download version of #73 (incl. all MP3 tracks) or purchase a copy at newsagents. Interviews, reviews & 70 FREE SONGS: Let's ROCK! Copies/subscriptions can be ordered direct by emailing [email protected], paying via Paypal. Send £6 (Inc P&P) for UK, £7.95 (inc P&P) for Europe, and £9.95 (inc P&P) for USA/Rest of World.